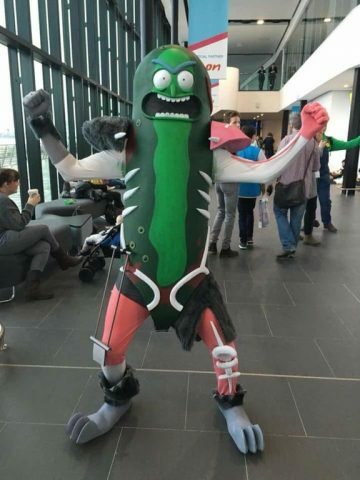 Pickle Rick Preserved in EVA Foam « Adafruit Industries – Makers, hackers, artists, designers and engineers! …it was all cut from an EVA foam sheet from polyprops with a template made for the dome and velcro running up the back behind the spine. Most of the rest was foam too, except for the brain which was bought on Ebay, and the leg brace was pvc pipe and wooden dowels. I was in a rush to complete and as such there where no fans so it got super hot, but I’m going to install some for the next outing in it as well as finishing off the laser/battery belt.